Welcome to the website for the Rotary Disabled Sports Team Championships. A GREAT BIG “THANK YOU” on behalf of the competitors to the Rotary Clubs of District 1060, who have sponsored all the events and made donations to support the 35th English Disabled Sports Team Championship. It is with regret though that we have had to cancel what would have been the 35th Championship as we did not have sufficient teams registered to make the event worthwhile. Partners, friends of Rotary and cameras visited the 34th Rotary Disabled Sports Team Championship over the weekend - with some of the evidence available via Gallery 2015. The 2015 event showed the best of both worlds. Athletes were able to compete fiercely in a truly sporting atmosphere and mixed with a bit of Rotary fellowship. Over the weekend we welcomed District Governor Paul Jaspal, Presidents and members of the sponsoring clubs and Rotarians from each of the competing Districts. We will have to wait another year to see if Leicestershire can continue their winning run. To get an idea of the atmosphere of the event, just take a look at the final of the 2015 Slalom event via the video below or have a browse through our photo galleries (available via the Main Menu). They did it again! 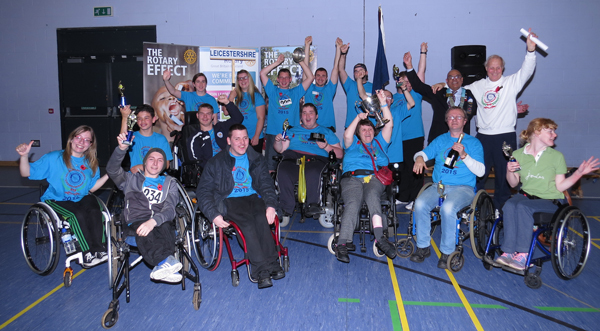 Congratulations to Leicestershire, the overall winners of the 34th English Disabled Sports Team Championship. Well done to South Yorks & Lincs for Male Weightlifting. Congratulations to Leicestershire for their victory in the Table Tennis. Well done to Rugby for winning the Female Weightlifting.